My Bar Crusher was very, very carefully selected. It was the end result of months of evaluating the market. Boat show, after boat show, and visits to boutique manufacturers. The 680HT was the end result. Most of my boating involves 50% cruising, 30% bottom bashing, 20% game fishing. Port Stephens offers the lot, from inshore water cruising, to island hopping and continental shelf fishing. I had to look at firstly strength. This included method of construction (frame and bulkhead placement) thickness of material, method of welding, tank facilities, etc. Secondly was the creature comforts, as in height of cockpit sides for kids and stand-up fishing, ride, storage and how wet the boat will be in weather. Stability, with weight distribution including motor selection, was the last, main, requirement. Looks took last place, which is a bit unusual when selecting a ‘she’. 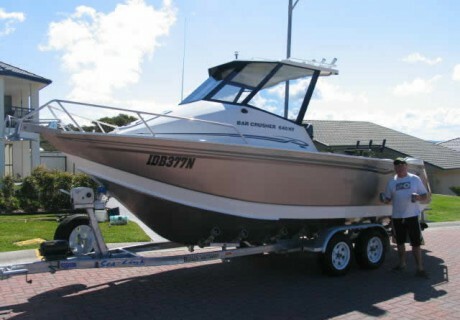 Finding a vessel that met my criteria automatically gave me the overall requirement, ‘safety’, which is critical no matter what type of boating or fishing is involved. I was well aware that my criteria was going to hard to find and will come at a cost, however “you only get what you pay for” and I am more than happy with the Bar Crusher product. She turns heads no matter where we go. The ride in choppy seas has to be experienced. Stability, with correct motor selection, again is hard to explain and has to be experienced. We just feel safe in this boat.